Peterborough, NH – Led by Tonya Dreher of Peterborough and just home from a three-week fundraising trek to Nepal, nine people from across the U.S. raised $100,000 to fund new gene editing research that could uncover a treatment for Duchenne muscular dystrophy, also referred to as DMD or Duchenne. 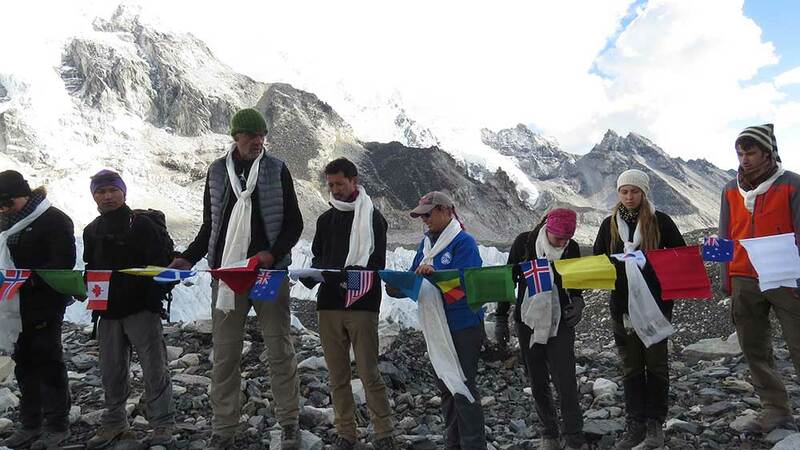 Inspired by Dreher’s son, Gus, the team sought donations from friends, families and organizations in support of the Hope for Gus Foundation and its signature Everest to End Duchenne fundraising trek to Mount Everest Base Camp. There, team members read the names of nearly 1,000 children who lost their lives to Duchenne, or who are currently fighting the disorder (including Gus), as scientists get closer than ever before to a promising treatment for Duchenne. The team raised a combined $50,000 and The Hope for Gus Foundation matched the donation, bringing the trek’s total contribution to medical research to $100,000. By age 12, most kids with Duchenne are in wheelchairs. They rarely live past their mid-20s. To help usher the Everest to End Duchenne funds in the most impactful and efficient manner possible, Dreher partnered with Parent Project Muscular Dystrophy, (PPMD) an organization that supports the Duchenne community through educational resources, fundraising coordination, advocacy, and identifying and funding potential treatments for Duchenne. “We are so grateful to our friends at Hope for Gus for this funding that will help further advance exciting technology in the gene therapy and CRISPR space. No one group or individual or even scientific approach will end Duchenne. It will take a combination of efforts and approaches. But when the Duchenne community comes together and literally climbs mountains on behalf of all people living with this disease – it makes our community stronger and brings us closer to the day we end Duchenne for every single person,” said Pat Furlong, founding president and CEO of PPMD. Recent and significant research breakthroughs in CRISPR, a new precision gene editing technology with the potential to correct mutations that cause Duchenne, offers hope for Dreher and the Duchenne community. Researchers at the University of Texas Southwestern Medical Center recently corrected Duchenne in human cells and in mice, offering new hope that a human trial for the treatment is on the horizon. And results from a Harvard University study unveiled on October 25 explore a new gene editing approach that could lead to treatment for thousands of diseases. The 2017 Everest to End Duchenne team is: Natalie Annis and Shae Annis of Alexandria, Minn.; Chris Balch of Wilton, NH; Cathy Barker of Austin, Texas; Thomas Buchanan of Wilton, NH; Dreher; Patrick Harvey of Mont Vernon, NH; Gregg Kaloust of Gardiner, ME; and Maxine Dunn of Peterborough, NH. Along with individual donors, sponsors include: The Hope for Gus Foundation; PPMD; Full Circle International; JB’s Keys to DMD; DJ’s Tap House & Grill; We are Fusion, Ivan’s Cleaning Services; 4 Jake’s Sake Charitable Foundation; Jar of Hope; Lipsie Me by LipSense; and SkidPro Attachments. Due to the success of the last two Everest treks, Dreher plans to organize a team to return again in early 2019. Planning for a 2018 domestic trek to Wyoming is also underway. The destination of Everest Base Camp – and other treks to come – is symbolic, as people with Duchenne may never be able to undertake such a challenge due to the terrain and physical demands. It symbolizes what those with Duchenne experience daily, and offers a way to remain connected with those for whom treatment did not come fast enough. The team read the names of nearly 1,000 boys into the wind upon reaching Mount Everest in a symbolic homage and hope for health and peace. To learn more about Everest to End Duchenne, how to donate or become a sponsor, join a future trek, or for more information about Duchenne muscular dystrophy, visit everesttoendduchenne.org. 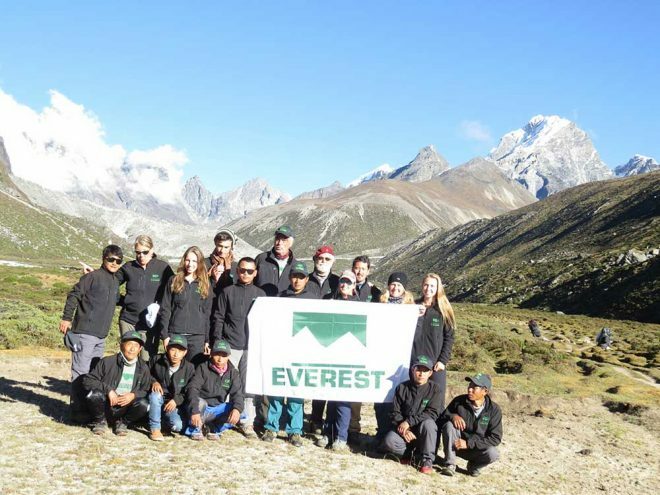 Learn more about Parent Project Muscular Dystrophy at parentprojectmd.org, and view photos and stories from the 2017 Everest trek at facebook.com/everesttoendduchenne. Everest to End Duchenne is a meaningful journey to Mount Everest Base Camp in Nepal that raises money to fund medical research to treat and cure Duchenne muscular dystrophy (DMD). The rare form of this progressive, muscle-wasting disorder is 100% fatal and affects one in 3,500 boys born each year, including Gus, a New Hampshire 12-year-old who inspired the trek after being diagnosed with DMD in 2010. The mission of Everest to End to Duchenne is to not only raise money directly for medical research, but to also raise awareness of the severity of DMD, trekking to Everest for these boys who cannot. To learn more about the organization, its affiliated nonprofit Hope for Gus, or how to join the 2017 trek, visit www.everesttoendduchenne.org. Duchenne is a fatal genetic disorder that slowly robs young men of their muscle strength. Parent Project Muscular Dystrophy (PPMD) is the largest most comprehensive nonprofit organization in the United States focused on finding a cure for Duchenne muscular dystrophy—our mission is to end Duchenne. We invest deeply in treatments for this generation of young men affected by Duchenne and in research that will benefit future generations. We advocate in Washington, DC, and have secured hundreds of millions of dollars in funding. We demand optimal care, and we strengthen, unite and educate the global Duchenne community. Everything we do—and everything we have done since our founding in 1994—helps boys with Duchenne live longer, stronger lives. We will not rest until every young man has a treatment to end Duchenne. Go to www.ParentProjectMD.org for more information or to learn how you can support our efforts and help families affected by Duchenne. Follow PPMD on Facebook, Twitter, and YouTube.